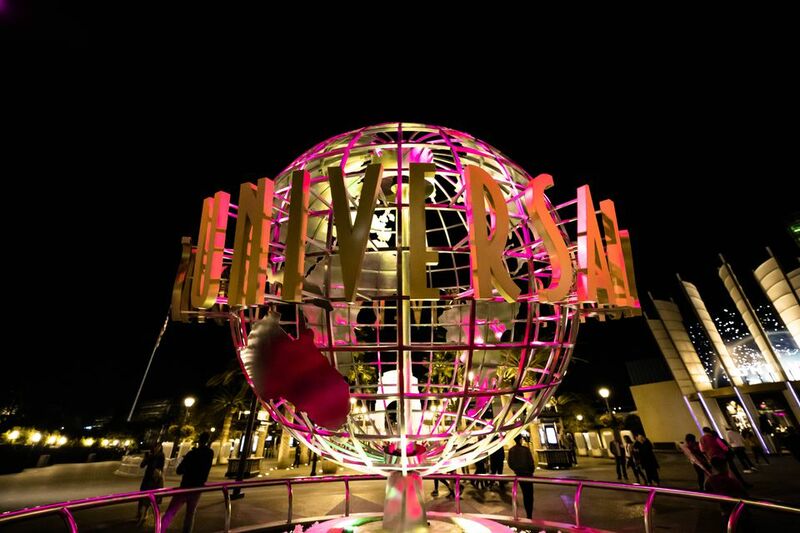 Universal City Walk is a pedestrian shopping and entertainment zone next to Universal Studios Hollywood. A stroll through CityWalk makes you feel like a tiny character in a cartoon. It is known for its massive signage including the giant guitar in front of the Hard Rock Café, the adjacent 5 Towers live performance stage with it's constant motion light show and giant-screen video, the toppling grande coffee cups above the Daily Grill, and King Kong with a seasonal wardrobe (or lack thereof) hanging over the crowd from the CITYWALK sign. Cars and spaceships protrude from buildings, and neon smoking cinnamon buns hover like flying saucers over Cinnabon. Nightlife on CityWalk includes the Hard Rock Café, Howl at the Moon dueling piano sing-along bar, SAMBA Brazilian Steahouse and Lounge, and Saddle Ranch Chop House with it's famous mechanical bull is next to the entrance to Universal Studios. There are also nighttime outdoor concerts on the 5 Towers Stage during the summer and over the holidays. Casual dining experiences range from tacos to crepes to Saddle Ranch Chop House, Hard Rock Cafe, Wolfgang Puck Bistro, Camacho Cantina, Wasabi, Bucca di Beppo and the Karl Strauss Brewing Company, and newer additions like Chef Ludo LeFebvre's Ludo Bird gourmet fried chicken, Dongpo Kitchen, Jimmy Buffet's Margaritaville and VooDoo Doughnuts to name a few of the more than 30 eating establishments. There are snack options from popcorn to churros and a fast food court on the 2nd level. For a full list of CityWalk businesses visit www.citywalkhollywood.com. The 18-screen Universal Cinema at Universal CityWalk got a complete makeover in 2017 with Christie laser projection and a perforated screen with 360 degree digital surround sound you can enjoy from ultra-plush reclining seats in screening-room quality theaters. The 8-story IMAX theater features IMAX’s next-generation 4K laser projection and 12-channel sound system. Concession upgrades include self-serve specialty popcorn, gourmet foods, real fruit smoothies, café style coffees and a Coca-Cola Freestyle self-service touch screen soda fountain featuring 165 different Coca-Cola drink products. Partial parking rebates for general parking (not Valet or preferred) are available at the box office with your movie ticket purchase. Visit www.fandango.com for show times and tickets. Shopping is dominated by sports memorabilia, specialty toys, souvenirs, luxury gadgets and collectibles, but there is also an Abercrombie and Fitch, Billabong, Hot Topic and a variety of extreme sports and surf attire plus the Universal Studiostore, where you can get your Harry Potter, Simpsons or other memorabilia without entering the park. iFly Hollywood at Universal CityWalk is a skydiving simulation where you can don a flight suit and experience what it's like to sky-dive without having to jump out of an airplane. A solid column of air keeps you suspended in a wind tunnel. There is a beginner option including training and one minute of flight time, or an advanced flyer option once you've become addicted to the experience. It's a truly exhilarating experience without the extra risks and expense of jumping out of a plane. It's worth the price bump to get at least one high flight at the top of the tube, but be aware that (at publication time) the video camera only captures the lower flight level, and for higher flights, you'll be off screen. So if a video souvenir of your flight is important, be sure to do at least one lower flight. Still cameras capture both the low and high flights. iFly is appropriate for ages 3 and up. Universal CityWalk hosts outdoor concerts and street performers, celebrity autograph sessions, talent contests and other themed events throughout the year including a children's event for Halloween and a New Year's Eve countdown street party. In 2011, CityWalk improved the outdoor concert venue, now called "5 Towers," adding 5 LED light towers around a new state of the art stage with multiple video monitors. They also updated the giant guitar in front of Hard Rock Cafe with a new paint job and running LED lights to match the rest of the glittering scene. The 5 Towers stage hosts a variety of live TV broadcasts from talk shows to reality talent competitions where you can be part of the audience. To see upcoming events at CityWalk, look at the calendar section of www.citywalkhollywood.com. CityWalk is easily accessible from the Metro Red Line. There is a free shuttle from the Universal City Metro Station. If you are taking the Metro at night, be sure to check when the last train departs from Universal City. More about riding the LA Metro. Parking: There are several parking options including general, preferred and valet. Check the website for prices and specials including weekday 2 hours free parking with lunch validation and nightlife parking discounts after 9 pm. You can also park for free at the Universal City Metro Station and take the free shuttle. Click here for Directions to Universal CityWalk Hollywood.